God has been talking to me. See, Colton sees something every Sunday that most of us visually see but many of us have stopped thinking about. Colton sees the stain glassed windows. Colton’s enthusiasm for the pictures, and the earnestness of his question made me come in the sanctuary one day, just to see what he was talking about. Stain glass windows have been around for centuries! In fact, in a world where most people weren’t literate, the church of the third and fourth centuries used the pictures and images around church to teach people about the faith. “A picture is worth a thousand words,” or something like that, right? Well, the more I considered the stain glass windows, the more I realized that there was a sermon here that I should be sharing. I knew you all didn’t want to hear a post-resurrection story about Peter’s forgiveness or about two men on the way to Emmaus for a fiftieth year in a row. And then I realized that the images that our church founders chose have something to say about what they, and we, believe. Let’s start at the back corner. Here’s a picture of Mary and Joseph with baby Jesus from Luke 2:16-18. It’s pretty simple, right? But in the image itself, we can see that Mary clearly cares for this baby – which, in a well-articulated way shows clearly more awareness than the average week old. And Joseph is present, shepherd’s rod prepared to protect the baby Jesus and his mother, Mary. But Joseph is doing something else interesting: he’s holding the light. Even while that magnificent star shines outside, Joseph is holding the light for Jesus before Jesus can hold it for himself. 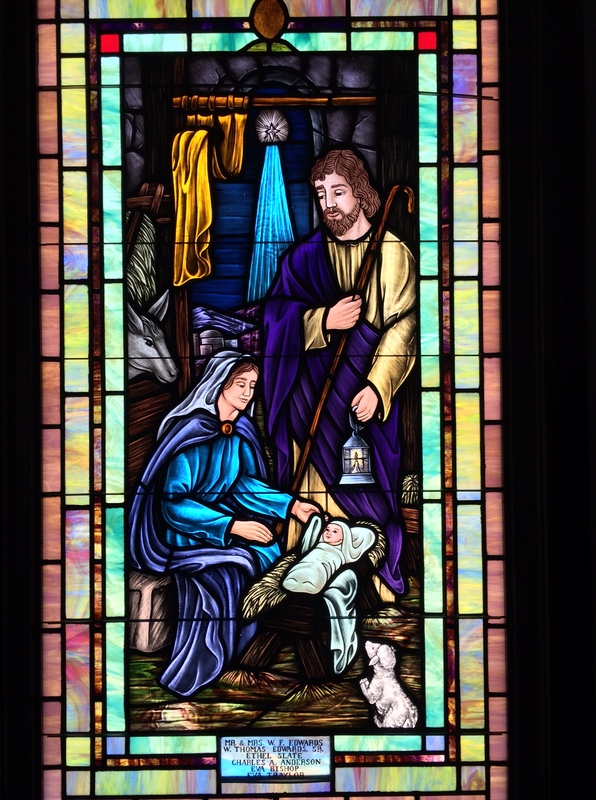 There’s love, and light, and a humble beginning here in a stable (with a token lamb paying homage to the king of the universe). The next two images go together,but the space in between them is pretty interesting, too. On the righthand side, we have a mother with some children, and on the other side, we have Jesus with a single child. And Jesus’ hand is up. Now, is he a crossing guard saying stop or saying go? Is he forbidding or is he summoning? Well, we know from Luke 18:15-16 that Jesus allows for the little children to come to him. We don’t know if the mother there is reluctant at giving her child over to Jesus, holding them back, or pushing a reluctant child forward. But we know that Jesus, see his holy glow, his kingly glory, there, is solemnly acknowledging the worth of the child who others didn’t see or accept. We see the tenderness of his hand, transferred by paint and glass, in the way that his hand rests on the first child’s head. 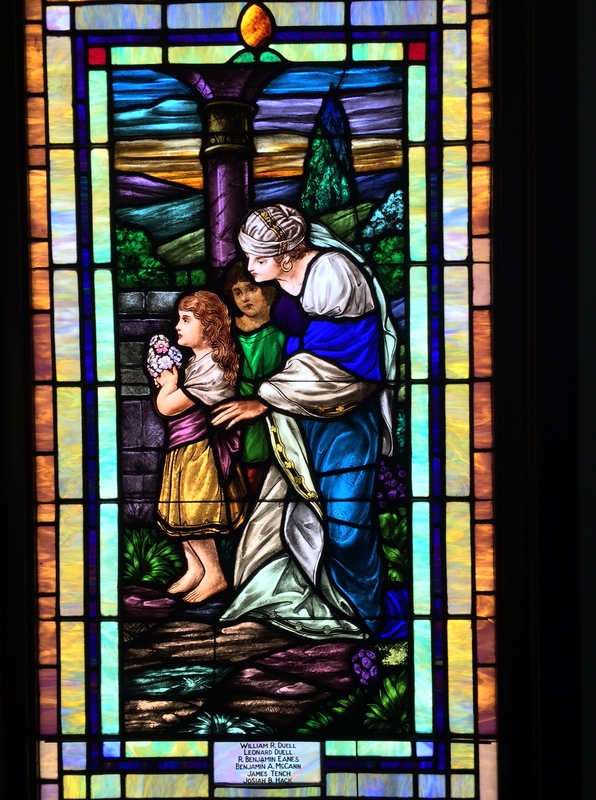 And we recognize that the child with the flowers knows that Jesus is worthy of adoration – of bringing a gift. This child gets what many of us struggle to understand: Jesus is fully God, fully present, and wonderful to behold. But how quickly things move, from good to bad, from light to dark. 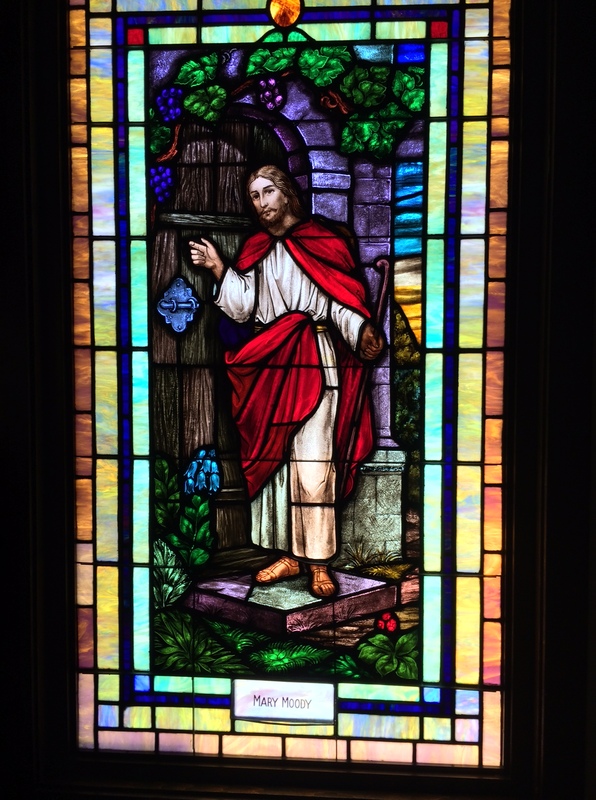 Our next stained glass window, tucked up in the choir loft shows Jesus praying. Now, Jesus prayed an awful lot, as in “he got up early in the morning and went by himself to pray”… but this isn’t one of those times. We can see to the far right that there are three figures, fast asleep from Luke 22:39-46. The disciples who once vowed their allegiance and support, even in the midst of everything, “to the death!”… lie fast asleep. Like some of you regularly on a Sunday morning … I kid, I kid. Right? Still, God hasn’t abandoned Jesus, as the light shines down from heaven. And this is the portrayal of Jesus as focused, centered, determined, moving toward his destiny. There is no question, just patiently and obediently following God’s will. 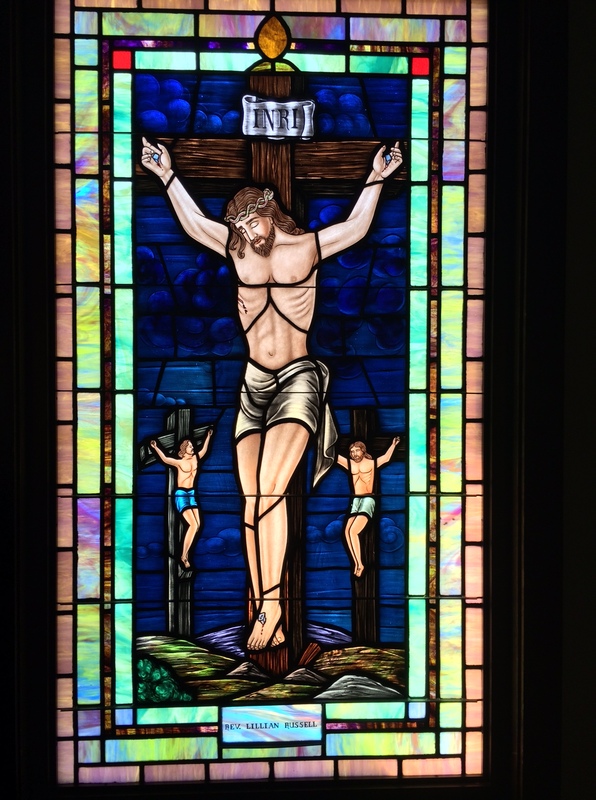 Our next stained glass window is that of the crucifixion. Here, Jesus is dishonored between two thieves, bleeding from his already pierced side from Luke 22:32-43. It’s this picture that fascinates my little friend Colton, because the idea of a man bleeding, dying even, in the middle of church, seems too much to consider. But that is where our faith stands out as extraordinary, so not ordinary that it is mind-blowing in fact. See how the one thief has the same covering as Jesus, and his beard looks likes the one depicted on Jesus? This must be the thief who confessed his sin and asked for forgiveness, to be remembered in heaven by Jesus. 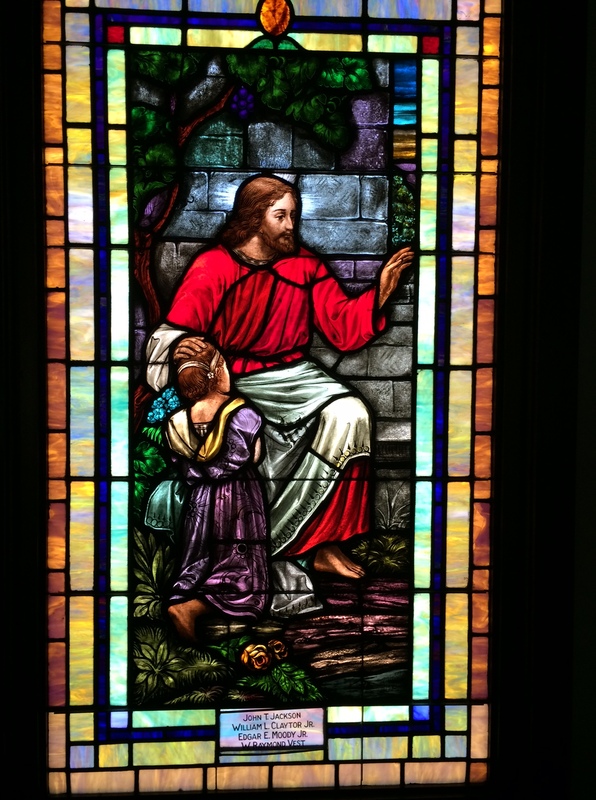 Captured in stained glass is true genius: wouldn’t it be wonderful if, as we grew in our faith, we began to look more and more like Jesus? Figuratively, of course, although, I’d dig the beard. There’s also the question of the inscription (in Latin) above Jesus’ head. Technically, it’s an abbreviation in Latin: “INRI.” The Romans put it there to mock Jesus, and it (fully spelled out) means, “Jesus of Nazareth, King of the Jews.” But it also mocks the Jews, who didn’t want Jesus as king, who had him crucified. “Here you go,” says Pilate. “Who’s so powerful now?” It’s amazing how in the shaming of Jesus, people end up articulating the irony that the God of the universe would die on a cross for God’s own, disobedient, and ungrateful creation. Next up, two illustrations or parables Jesus told explain what Jesus’ teaching was all about. Interestingly enough, the church didn’t immediately follow the crucifixion with a resurrection scene. 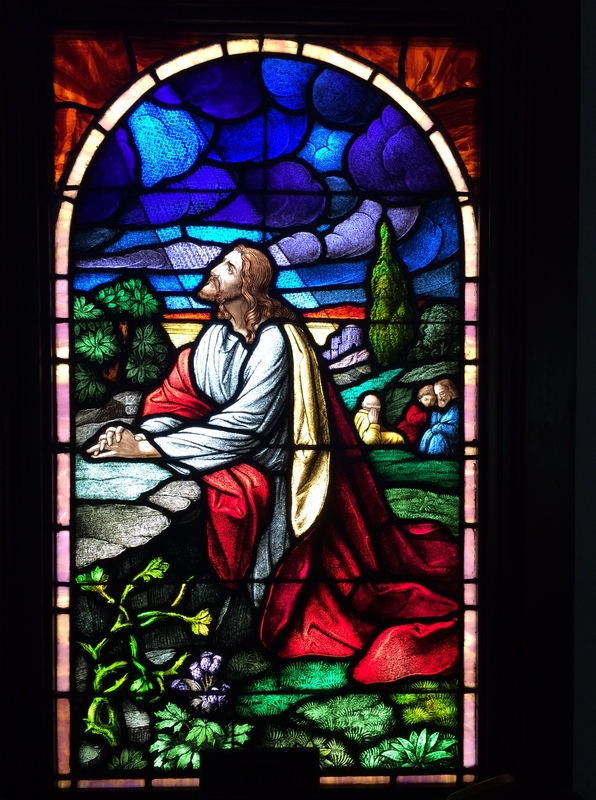 The stained glass leaves us with the images of what Jesus’ taught his disciples to consider: that God wanted to have a relationship, that God was a protector and provider, that God would not force himself onto anyone but offer up an invitation! How different this is from much of what we hear today in other circles about faith: how it is by coercion and force, and power, when these images share with us the tenderness of a God who wants to know and be known, but would never demand of you. The first is actually a combination of Jesus’ teachings and Revelation 3:20. 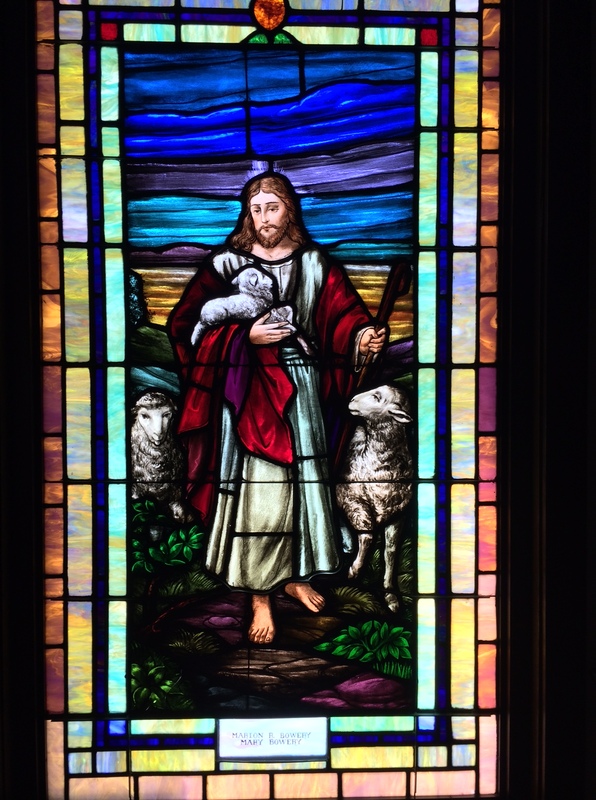 Again the tender care of the shepherd is there in John 10:11-16. The beauty of a divine meeting is there. If only we would follow or answer or choose to be who we’re meant to be from the very start – as children. Would we recognize what is offered? Would we choose it for ourselves? Jesus offers so much, so poetically represented in these paintings, and yet, so many people outside the church have not heard. That’s the irony for me as I look at the stained glass windows here. They are for us. Outside our church, they don’t show up well. The light doesn’t travel from the church out to the world, but from the sun in through the windows. The reminders of the windows are to edify us, to lift us up, to comfort us, so that we would leave and carry the story with us. Of course, there’s one last picture. It’s of Jesus on a cloud. Is it the ascension? Is he rising up when the Holy Spirit descends at Pentecost in Acts 1:9-11? Or is he descending like he promised in Mark 14:62? Is it Jesus’ second coming, when he will take the world as his kingdom and every knee shall bow? I don’t know. Maybe it’s both and. Jesus does ascend first, but he descended to be with us once, and he will do so again. Either way, it shows that God was, and still is, with us. And we are in God’s heart. Those are the pictures our church forefathers and mothers picked. Jesus born divine, Jesus with children, Jesus’ passion, Jesus’ comforting teachings about grace and inclusion, Jesus’ rising and return. Powerful images, no doubt. All of that from a series of stained glass windows. Stained glass windows that we can see in here, but that aren’t visible from outside the church. Stained glass windows that are beautiful from when the light outside the church shines in and illuminates the pictures. The church has to be in the world but not of it, but it needs the world – the light from outside and the Light of the World (from inside) to illuminate these windows. Stained glass windows that remind us that we’re not to get too comfortable in here because we’re supposed to be out there sharing the stories. Now, it’s time we remember that the church’s history started with an empty tomb, and then grew with the running feet and loud proclamations of those who knew the truth. May we take these pictures into our hearts and minds, and share that same message in the world outside. Amen. This entry was posted in Sermons, Theology and tagged resurrection, Stained Glass Windows, theology. Bookmark the permalink.